If the ID of the upper Rim is more than 18 inches, the 35a series filter will slide in from the top and the filter gasket will seat against the conical orifice pan. It gets secured with the provided hardware from underneath an additional gasket is not needed. 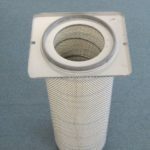 If you collector has a helical style orifice or if you will be installing an internal Phil Thien Baffle, you will need to make a donut for the filter gasket to seat against. See the illustrations in the April 2013 issue of Fine Woodworking magazine or contact us. 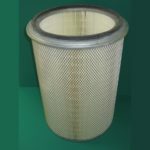 In this case a C1425C Filter should be considered as they have a mounting flange with pre drilled holes in the open, gasketed end. If the diameter of the upper rim ID is just over 17 inches like some old Jet 1100 collectors, you will need to make a donut for the filter gasket to seat against. See the illustrations in the April 2013 of Fine Woodworking magazine. Donuts are discussed on this site. If the ID of the upper rim is less than 16 inches, the 35A series filter will rest on top of the rim and additional gasketing is needed. The filter gasket does not mate with the rim so we recommend our ETG-55 edge trim gasket which gets pressed onto it. The filter gets secured to the lip of the hole in the orifice pan with the provided hardware. See the 35A series instruction sheet which covers most installations. If the ID of the Upper rim is less than 16 inches and there is no orifice pan, use a 35A series filter plus and ETG-55 edge trim gasket. The additional mounting hardware package comes separately with the ETG-55. If the upper rim diameter is greater than 21 inches or if the hole in the orifice pan is more than 15 inches, you will have to make a donut. 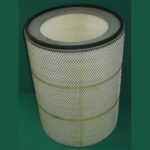 All filters have one gasket and ship with two (2) clear plastic, 4 mil dust collection bags. All 35A Series filters ship with three (3) universal floating gear latches included. (FGL-U). If your collector has an internal concave, conical orifice pan it should be located between the air inlet and the top rim. If it is not, please contact us. 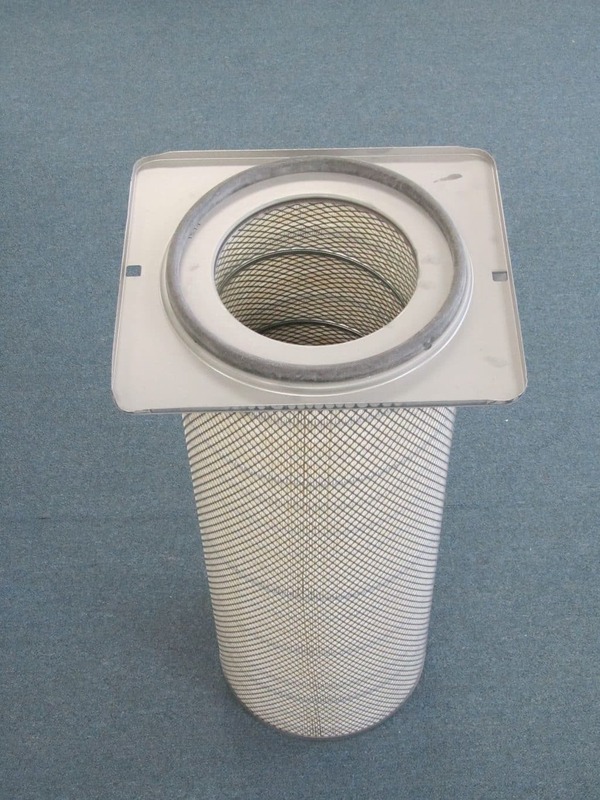 The 35A series filters (available in Blend, Spun Bond and Nano) are usually secured to the collector using the provided hardware from underneath the filter. The gasket usually mates with the conical orifice pan but with an ETG-55 edge trim gasket, they can be mated to the rim of smaller collectors. These filters are open/closed. If an internal Phil Thien Baffle will be used, consider making a donut and using a C1425C filter which mounts directly to the upper donut. If a 35a series filter is used, the baffle location makes it difficult to get to the hardware. The C Series filters (available in Nano only), have a round mounting flange with pre-drilled holes and gasket which make them ideal for mounting to a flat donut. This was nicely illustrated in the April 2013 issue of Fine Wood Working Magazine. If you want a Flanged “Spun Bond” Filter get a 9E110SB (Open/Closed) filter. They can also be recessed or suspended and used for portable or ambient dust collection. These filters have what we feel to be the optimum balance between efficiency, filter area, pleat spacing and dust release properties. Available in open/closed and open/open configurations. The 9L series (available in Nano and Spun Bond) have a 14.25 inch by 16.0 inch steel mounting flange plus gasket and are sometimes used (with a donut) when extra filter area is desired. These are 34 inches tall and most commonly found stacked on Do-It-Yourself cyclone systems. Open at the flanged end (with gasket), open at non flanged end. Loose gasket provided. Flange dimensions: 14.25″ x 16″. Filter dimensions: OD= 12.75″, ID= 8.4″, Length= 34″. Heavy duty outer cage, 230 sq. ft. of MERV 15 Nanofiber filter media, 99.999% efficient @.05 microns. More square footage than C1425 filters, Stackable: Non flanged end to non flanged end or with 13R230NANO filters.